It is a national effort carried on by activists, community leaders, and national and local organizations, to raise awareness about dating abuse, promote programs that support young people, and encourage communities to prevent this form of abuse with the goal of decreasing the prevalence of dating abuse among young people. 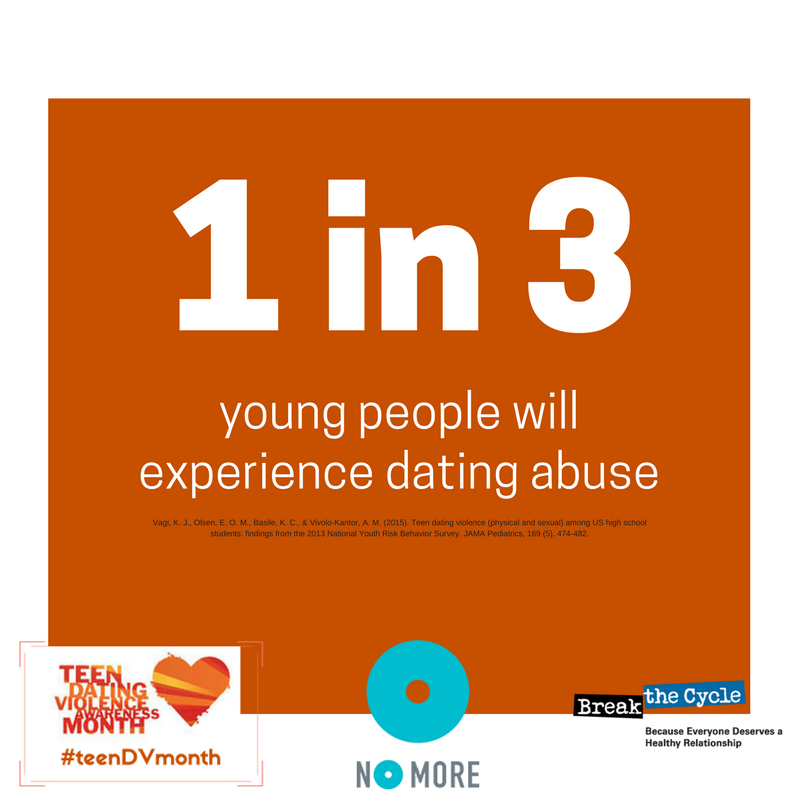 The National Resource Center on Domestic Violence (https://nrcdv.org/) defines TDV as a pattern of abuse or threat of abuse against teen-aged dating partners, occurring in different forms, including verbal, emotional, physical, sexual and digital. TDV occurs across diverse groups and cultures. Although the dynamics of TDV are similar to adult domestic violence, the forms and experience of TDV, as well as the challenges in seeking and providing services, make the problem of TDV unique. For the past ten years, Break the Cycle (https://www.breakthecycle.org/) has been hosting an awareness campaign aimed at generating conversations about healthy relationships and preventing teen dating violence and abuse. • What does dating mean to you? Does anyone you know date? If not, what do they call it? • What are some things that you like about your friends? What about how they treat you? • What are some things you don’t like about how your friends act or how they treat you? • Let’s say you are seeing someone. How would you like someone you are hanging out with to treat you? • Choose one couple you know of who you think have a good relationship and one couple who you think have an unhealthy relationship. Why did you pick these couples? • Do you think there is a good way to argue? Do you think there are unfair ways to argue? Have you ever argued unfairly? What could you have done to make it a fair argument? • What does it mean to stand up for yourself? When you stand up for yourself, how does it make you feel? Do you think you are being strong, bossy or pushy? Why? • What should you do if someone you’re dating threatens you? What if someone you are dating tells you to keep quiet and not tell anyone, even though you know it is wrong? Teen foster youth have been found to be at a higher risk for many adverse outcomes including those as a result of Teen dating violence (TDV). Previous maltreatments, multiple placements, and the lack of loving and supportive caregivers contribute to many Teen foster youth seeking love and acceptance in the wrong places. Consistent and caring foster parents can change the trajectory of a Teen’s life. Foster Hope for a Teen in your community. Open your heart, open your home… Become a Foster Parent. Visit www.FamiliesFirstFL.com/get-involved or contact us at (813) 290-8560 to learn more.